CCE, Academic Calendar implementation Instructions for TS Schools: Rc.405 CCE and Academic Calendar implementation Instructions for All Telangana TS Schools. 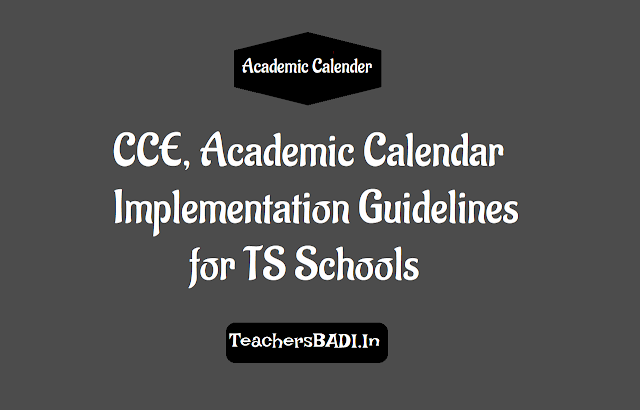 Rc.No.405, Subject: SCERT, Telangana, Hyderabad - Academic Calendar and other academic issues and implementation of CCE in all schools including private recognized schools - Orders issued - Reg. All the RJDSEs and DEOs in the State are hereby informed that as per Government Orders vide reference 1 cited, detailed instructions have been issued vide reference 2 cited on the implementation of academic calendar and other programmes. In this regard, the number of periods and distribution of timings in the school time table is given here under. The academic calendar showing the distribution of syllabus for both curricular and co-curricular activities have been developed. The printed calendars will be supplied to the schools through DEOs. The calendars will be printed in Telugu, English and Urdu mediums for both Primary, Upper Primary and High Schools. These calendars have been placed in the SCERT website i.e. www.scert.telangana.gov.in. 1. The School Assistants of Physical Science shall take up Mathematics classes for classes VI and VII along with Physical Science subject for classes VIII, IX and X. 2. The Maths School Assistants shall take up computer classes along with Mathematics subject for classes VIII, IX and X. 3. The Head Master must plan for implementation of co-curricular activities by assigning the subjects to the teachers keeping in view of work load. 4. Head Master must see that equal allocation of periods combinedly for both curricular and co-curricular areas. 5. The Head Master shall develop time table for the school showing curricular and co-curricular areas along with teachers responsible to teach the subjects and display in the Head Master room and staff room. With regard to CCE implementation, the internals and externals i.e. FAs and SAs are same for classes VI to X i.e. 20 marks for Formative Assessment and 80 marks for Summative Assessment. a) With regard to projects, one project for each Formative in each subject may be assigned. The projects may be distributed during the month and not to give all the projects at a time to the students. All the record work/ notebooks shall be completed as per the schedule of the Formative Assessments and keep ready for inspection. b) The FA-wise marks shall be uploaded immediately after completion of the FA in the given computerized programme after verification by the competent authorities. All the assignments, written works as a part of Formative Assessment shall be written by the 4 students on their own and shall not be copied from the guides, workbooks, study material etc. a)Guides, workbooks, study material etc. have been banned vide G.O. Ms. No.17, Dated:14.05.2014 issued as a part of examination reforms. b)The Dy.EOs and concerned Head Masters are responsible if such guides/ study material found with children and used by them. For effective implementation of internals, the use of library and lab is very much necessary. All the Head Masters of government and private schools shall be informed to make libraries and labs functional and perform the experiments, book reading and reflections, analysis of contemporary social issues as a compulsory activities. a) During the visits to the private schools, it was observed that the CCE is not being implemented properly. b) Cumulative Records have not been used and they still use one page Progress Reports. Certain managements complained that there is no information or instructions on the use of CCE in their schools. c) Therefore, all the DEOs are requested to communicate the Government Orders pertaining to CCE and class IX and X examination reforms vide references 3 and 4 and monitor the same for its implementation in the private schools. The instructions pertaining to implementation of academic calendar vide reference 2 cited and the instructions in the present proceedings must be sent to all private school managements for its implementation. The academic calendar and instructions must be implemented in all the schools in Telangana State i.e. government, government aided, municipal, tribal, residential institutions, private recognized schools. The Textbooks, Syllabus Books, Teacher Handbooks, CCE Records, Registers, Cumulative Record for children have been uploaded in the SCERT website www.scert.telangana.gov.in and the same may be informed to all the schools including private recognized schools. The all the RJDSEs and DEOs are requested to take necessary action and inform the instructions pertaining to academic calendar and curriculum, CCE implementation to all schools including private schools and supervisory officers.